2212 passing Tempe with the AK Track Recording Cars, bound for Meeks Rd. I’m fairly sure that there’s an old saying talking about how a bird in the hand is better than two in the bush. I never quite understood the phrase itself, as I have no interest in holding a bird in my hand, as I imagine it would be rather panicked, and peck violently at my extremities. I would be happier to have an additional bird, and have both birds happily singing away in adjacent greenery. Nevertheless, I understand the phrase to mean that it’s always better to have one of a good thing, than to be greedy and miss out altogether. This theory leads into the next step in the saga that is my continued game of cat and mouse with the QRNational 421 and 422 Class locomotives (at least, those of the latter class painted in the former Northern Rivers Railroad colour scheme, not the ARG or QRNational schemes). Allow me then, to rephrase. A 422 on the memory card, is better than two missed. The premise was (as it always is) sound, in theory. Fred and I would start the day at Yennora, to get a shot of the 4-car C-Set that is a regular on the twice daily service that operates from Campbelltown to Blacktown. We would then get a photo of the motive power of T280 (the P&O container trip train from Yennora to Port Botany), before scooting over to Rookwood to await 5MB7 (QRNational Melbourne to Brisbane superfreighter), which would (in theory) be followed by 2152 container freight from Glenlee (where the QRNational intermodal freights attach and detach Sydney loading). All going to plan, 42202 would be the lead unit on 2152, which we would capture in perfect sunshine, and still be home in time for lunch! Of course, everything started off against the plan, with the second car of the C-Set covered in graffiti, the work of children who never progressed beyond the “drawing on the walls with crayons” stage of intellectual development. As I am loathe to glorify such “artists” (and I use the term loosely), the photo is safe on my HDD, where it will remain as a record (should the C-Sets be mysteriously withdrawn in the next week). T280 was sighted shunting the freight terminal at Yennora, behind 4477 and 864, and so we relocated to the railway overpass at Guildford for a shot. While driving around Yennora Yard, 42202 was sighted in the back of the yard, attached to a rake of container wagons. We assumed (incorrectly) that 1251 might have missed the peak hour and would be departing after T280. Standing on the bridge for a little over an hour, much to the amusement of passing Australia Post workers, we also photographed a quad of NR Class on 6NY3 with an impressive train trailing behind them, as well as quad 82’s on LG77 empty coal to Lithgow and LDP’s 005 and 009 on 5MB7. A nice additional sighting was the passing of Mechanised Track Inspection vehicle ML-039 at 1029, bound for Enfield. With a sighting coming in of GWA owned 2212 (42212) at the head of the AK Track Recording Cars passing Campbelltown, we headed east again, this time for Tempe. 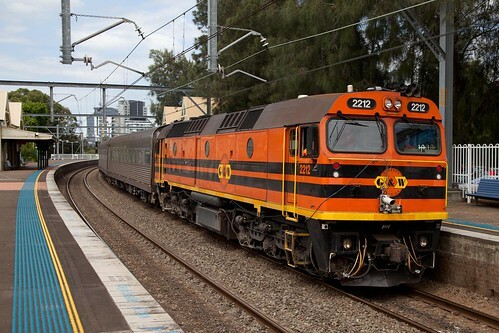 2212 is a rare visitor to NSW, normally found working trains in South Australia for Genesee & Wyoming Australia. Thankfully the train was made to wait at Revesby to follow the up all stations service, and so we beat it to Tempe by a matter of minutes (as opposed to missing it by a matter of minutes…). It was then that we learned that 42202 would be heading up 1253 to Glenlee, departing after T286 to Botany. With the curse of the high-sun, the rising temperature, it was decided to let this one pass to the keeper.